Powers/Abilities: As the Wraith, Watanabe wears a bulletproof armored costume that used Mysterio's mist-dispensors to generate a mist laced with Mr. Fear's fear-inducing fear-gas, or a corrosive acid mist; she also carries gas grenades. The costume also has prehensile tendrils on its arms that could ensnare and restrain a target; they also contain polygraph sensors, enabling her to tell when someone in her clutches was lying. Her mask formerly incorporated Horizon Labs' "Big Sister" facial recognition technology; it also contains a communications uplink. She formerly wore a highly realistic mask of Jean DeWolff underneath her Wraith mask. Watanabe is a skilled hand-to-hand combatant, and a capable police officer. History: (Amazing Spider-Man III#19.1 (fb) ) - Young Yuri Watanabe attended a ceremony where her grandfather was awarded the NYPD Medal of Honor. He assured her that one day she would be in his place, and that he would be proud of her. (Amazing Spider-Man III#19.1 (fb) ) - Yuri joined the US Army. (Amazing Spider-Man III#19.1 (fb) ) - Yuri attended her father's bribery trial. (Amazing Spider-Man III#16.1 (fb) ) - Joining the NYPD, Yuri was mentored on her first year on the force by Detective Teddy Rangel. (Amazing Spider-Man II#619 (fb) ) - Yuri came up through the ranks of the NYPD alongside her friend Jean DeWolff, who always spoke highly of Spider-Man. (The Many Loves of the Amazing Spider-Man#1/2) - Medical examiner Ray Cooper and Captain George Stacy asked Officer Watanabe to look after their daughters (Carlie and Gwen, respectively) at the station. After finishing up a mountain of paperwork, she found the girls rifling through Stacy's files. Her displeasure was somewhat ameliorated by the fact that they seemed to have uncovered a vital clue to the identity of a serial child strangler. (Amazing Spider-Man II#619 (fb) ) - Years ago, Watanabe and DeWolff, along with Captain George Stacy, brought a dead Maggia informant in to medical examiner Ray Cooper, greeting his visiting daughter Carlie on the way out. (Amazing Spider-Man II#600/1) - Responding to a tip from Daredevil, Watanabe, now a captain herself, came down to the Bar With No Name, a super villain hangout; although the bar's owner, Deke, protested that there were no villains in sight, she demanded to see his liquor license, and when he couldn't produce it, she shut his establishment down. (Amazing Spider-Man II#618) - Captain Watanabe examined a Maggia stash house, hidden in a mattress warehouse, that had been hit by Mister Negative's gang, the Inner Demons. Later, as she sped towards a Maggia/Inner Demons shootout in the meatpacking district, she was surprised to find out that Carlie Cooper, now a police scientist, was the officer who'd called it in. She ordered Cooper to stay out of it. (Amazing Spider-Man II#619) - Watanabe arrived on the scene, where she found Spider-Man. Remembering how well Jean had spoken of him, she allowed him to accompany her men as they stormed the building, where she was surprised to see numerous dead mobsters (who had actually had their deaths faked by Mysterio) battling the undying Inner Demons. When Spider-Man seemingly killed one of the mobsters (another of Mysterio's illusions), the Maggia fled, and Watanabe pointedly gave Spider-Man a chance to escape before he could be questioned. She assigned Carlie Cooper to accompany the "dead" man to the morgue. (Amazing Spider-Man II#620) - Watanabe arrived at the Empyrean Opera House, the latest front in the gang war. Carlie Cooper arrived soon after, seeking out her father (whose death had also been faked by Mysterio). Watanabe tried to send her home, but they were interrupted by Spider-Man, who dove out of the building just as Mysterio set off a bomb inside, killing a number of the combatants. Watanabe let the fire department enter the building, and recovered documents that indicated that Mysterio was planning to fake Jean DeWolff's resurrection next. Later, as Spider-Man recuperated on the sidelines, Watanabe offered him help from the department any time he needed it, an offer he readily accepted. (Amazing Spider-Man II#621) - As the police continued to pick through the ruins of the Empyrean Opera House, Cooper explained to Watanabe that the gas Mr. Negative used was only designed to kill Spider-Man. Later, she called Captain Watanabe to arrest Ray Cooper. (Amazing Spider-Man II#664 (fb) ) - Watanabe recovered Mysterio's Jean DeWolff mask. (Amazing Spider-Man II#650/1) - Watanabe arrived at Horizon Labs, where the Hobgoblin had broken in to steal a sample of synthetic Vibranium. Horizon's CEO, Max Modell, noted that his newest hire, Peter Parker, was missing; when he led Watanabe into his lab to find him, however, they found him (secretly fresh from battling the Hobgoblin) in his underpants and with his headphones on, claiming to have missed the entire thing. Watanabe offered to take his statement when he had some pants on. (Amazing Spider-Man II#651/1) - Watanabe and the fire department established a perimeter around Fisk Tower when the synthetic Vibranium began to take the building down. As it crumbled, one of her subordinates asked her what she was going to do about Spider-Man, once it became apparent that he was involved; she responded by telling him that, by destroying the Kingpin's headquarters, Spider-Man had done them a favor. (Amazing Spider-Man II#655) - When the villainous Massacre took a number of hostages at a downtown bank, Captain Watanabe tried to negotiate with him, but he was uninterested in talking, and killed a hostage to illustrate his disregard for human life. (Amazing Spider-Man II#656) - To further prove his point, Massacre set off a bomb in the bank's west wing, killing seven more hostages. Stunned by Massacre's inhumanity, Watanabe was unsure what to do, but was heartened when Spider-Man arrived. Unfortunately, as the web-slinger had recently lost his spider-sense, Massacre shot him and escaped. Later, Watanabe came to Horizon Labs, where Max Modell's new facial recognition technology identified him as Marcus Lyman, a brain-damaged ex-stockbroker. Soon, she was notified that Massacre had taken hostages in his old Wall Street firm, but when she arrived at the scene, she found that Chief Pratchett had been given command of the situation after her earlier failure to stop the villain. Luckily, Spider-Man, armed with a new bulletproof suit, took down Massacre this time. (Amazing Spider-Man II#664/1 (fb)/Superior Spider-Man#4 (fb) ) - Troubled by the Massacre incident, and remembering that it had been two vigilantes who took down Jean's killer, Watanabe decided to work outside the law to give the city's criminals a dose of fear. Watanabe faked an accident at Special Crimes Evidence Storage, claiming that a pumpkin bomb had exploded, destroying some of Mysterio's technology, canisters of Mr. 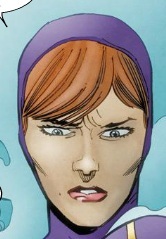 Fear's fear-gas, and Mysterio's Jean DeWolff mask - all of which she had in actuality stolen. She incorporated the supervillain technology into a suit mimicking the one worn by Jean's dead brother Brian, and wore the Jean mask underneath it. She also acquired Horizon Labs' facial recognition technology from Horizon scientist Uatu Jackson. She soon began striking terror into New York's underworld, claiming to be the ghost of Jean DeWolff, returned to life as the Wraith. (Amazing Spider-Man II#658/1 (fb) ) - The Wraith came across a drug deal-turned-robbery-homicide; she told the perpetrator that if he didn't turn himself in, she'd come back for his soul. (Amazing Spider-Man II#658/1) - Watanabe called in Carlie Cooper to process the Wraith crime scene, and hauled the terrified murderer in. (Amazing Spider-Man II#663/1) - At the East River docks, the Wraith attacked Ronnie Chin, a member of Mr. Negative's gang. Confronting him with knowledge of his past crimes, she demanded to know who Negative's inside man on the docks was. To frighten him further, she unmasked, revealing herself as Jean DeWolff, just in time for the vigilante Anti-Venom to arrive. She escaped, disappearing before the stunned Anti-Venom's eyes. Later, at the crime scene, Chin confessed all his crimes to Watanabe, and told her about what he'd seen. Cooper, who was examining the scene, mentioned Mysterio's Jean DeWolff mask to Watanabe, but she insisted that she'd had it destroyed. Unbeknownst to Watanabe, Cooper slipped her phone into the captain's bag. (Amazing Spider-Man II#664/1) - The Wraith attacked Negative's inside man, Robert Ross, in his palce of business, Rothner Antiques. Bringing up his history of human smuggling and revealing her "true face", she convinced him to reveal everything about the heroin delivery (hidden inside a shipment of statues) that was coming in that night, destined for the Metropolitan Museum of Art; unbeknownst to the Wraith, Cooper had followed her there, and confirmed via infrared that she was no ghost. At the Met that night, the Wraith found Spider-Man webbed to a statue; freeing him with her acidic mist, she tried to convince him that she was a ghost, but he saw through her ruse - but was willing to team up with her against Negative anyway. They found Anti-Venom battling Negative and his Inner Demons, and joined in. The Wraith's fear-gas failed to affect the Inner Demons, but when Spider-Man landed a staggering blow on the crimelord, her facial recognition software was able to kick in, revealing Mr. Negative as the philanthropist Martin Li. She broadcast her finding to every smartphone, TV, and computer in the city. Negative and his Inner Demons fled, covering their exit with a cloud of cyanide gas; the Wraith followed suit, unwilling to face the police. Changing back to her civilian guise, she ran into Cooper, who revealed that she'd discovered her secret. Watanabe explained everything to her; Cooper had no intention of turning her in, however, and instead suggested that, if she'd been able to discover the Wraith's identity, someone else could too. She recommended that Yuri - and the Wraith - disappear for a while. (Amazing Spider-Man II#674 - BTS) - Captain Watanabe went on leave. (Superior Spider-Man#8) - Carlie Cooper called Watanabe and told her that she believed that Otto Octavius had taken over Spider-Man's body. While Watanabe still held some resentment over Cooper uncovering her activites as the Wraith, Carlie appealed to her better nature and convinced Yuri to help her. (Superior Spider-Man#10) - Returning from leave, Watanabe interviewed a number of cops about the death of Massacre, who Spider-Man had shot and killed. Every officer she talked to, however, danced around the truth, protecting the web-slinger. Cooper secretly listened in to the interviews; after the interviewees had all left, she confirmed to Watanabe that, having autopsied Massacre herself, only Spider-Man could possibly have shot him. (Superior Spider-Man#14) Watanabe and Cooper surveyed the wreckage of the Kingpin's Shadowland fortress, which had just been demolished by Spider-Man, his Spiderling henchmen, and his giant mechanical Arachnaughts. Cooper questioned how he could afford all this, and he suggested the city was paying for all of it. After he left, Watanabe noted that Cooper's theory was getting more plausible - and that Spider-Man's expenses would have showed up in the city's budget. She announced her plan to follow the money...as the Wraith! 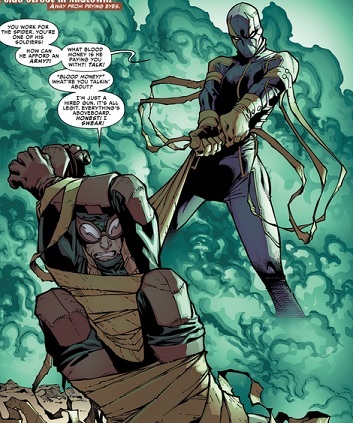 (Superior Spider-Man#16) - While Spider-Man moved to take out the Hobgoblin, the Wraith grabbed one of his Spiderlings and interrogated him, asking him where Spider-Man's money was coming from. The henchman told her that everything was on the up-and-up; her polygraph sensors confirmed it, and her facial recognition systems found that he had no criminal record. Cooper contacted her and asked to get the man's bank account number; although she was dismayed at their lack of leads, the Wraith did so, allowing Carlie to find that the man was being paid from a large offshore bank account. (Superior Spider-Man#19) - Watanabe and Cooper tracked the money trail to the Caribbean island of Grand Tauro, notorious as a tax shelter. As the Wraith, Yuri tracked down his banker, Antoine Morant, and assaulted his armored SUV. To escape gunfire from his bodyguards, she leapt off his car and into the Jeep being driven by Carlie...but not before flooding the SUV's vents with fear gas. They followed him to his compound, fought their way through his guards, and found him shredding his documents. Carlie shot his shredder and grabbed a document from his hand - proving that Spider-Man's money came from the account of Dr. Octopus! (Superior Spider-Man#20) - Back at Cooper's apartment, Carlie and Yuri wrapped up their evidence; Watanabe suggested that it wouldn't hold up in court, but Cooper told her that she was taking it to the Avengers, instead. Watanabe departed, with Carlie promising to keep her involvement in the investigation a secret. (Superior Spider-Man#22) - When Carlie stopped responding to calls, Watanabe investigated, and found Cooper's apartment had been ransacked - and while her possessions were all there, her evidence against Spider-Man was gone. She suspected Spider-Man was responsible, and vowed to bring him in, dead or alive. (Superior Spider-Man#23) - Finding that the last call on Carlie's phone had been made to Mary Jane Watson, Watanabe came to see Watson at her nightclub, MJ's. They listened to the message, which warned MJ to stay away from Peter Parker. MJ was cagey about Peter's involvement with Spider-Man, so Yuri left her with a warning not to mention the message to anyone. (Superior Spider-Man#24) - Watanabe burst into Jay and May Jameson's apartment, looking for Parker. Instead, she found a screaming Mary Jane and a missing Parker (as Parker and the Venom symbiote he was harboring had just departed). Finding Mary Jane evasive again, Watanabe took her down to the station for questioning. (Superior Spider-Man#25) - The Jamesons came down to the station to demand that Watanabe release Mary Jane; she did so, but warned her that she'd be watching her and Parker. (Superior Spider-Man#27) - A month later, Watanabe came down to Parker Industries, looking for Peter Parker. His business partner, Sajanai Jaffrey, told the captain that she hadn't seen him in weeks either, but Watanabe didn't believe her, and left officers on the premises in case he returned. (Superior Spider-Man#28) - Watanabe stalked Parker Industries as the Wraith; when Parker emerged from the water and approached the building, she leapt into action, dousing him with fear-gas, ensnaring him with her tendrils, and demanding to know Carlie's whereabouts. He told her he had no idea, and her sensors told her he was telling the truth, which confused her. She was even further confused when Monster (Carlie Cooper, having been captured by the Goblin King and doused with insanity-inducing Goblin serum) swooped down and attacked her - and thanks to the Goblins' tampering with the facial recognition software she shared with Spider-Man's Spider-Bots, she was totally unable to see her assailant! Monster quickly knocked Wraith unconscious. (Superior Spider-Man#29) - While Parker and Sajani tried to purge the Goblin serum from Carlie's system, the Living Brain restrained the still-unconscious Wraith. She began to come to, and the Brain asked Spider-Man if it should offer her a beverage. (Superior Spider-Man#30) - The Wraith battled Goblin-controlled Spider-Slayers alongside the Avengers Black Widow, Spider-Woman, and Wolverine. (Superior Spider-Man#31/1) - Joined by more Avengers and the vigilante Cardiac, the Wraith fought the Spider-Slayers and the Goblin Knight in Midtown, falling prey with the others to the latter's Lunatic Laugh. Luckily, Spider-Man - Peter Parker once again - arrived and drove the Goblin off, leaving Wraith, Cardiac, and the Avengers to handle the remaining Slayers while he went to battle the Goblin King. (Amazing Spider-Man III#16.1) - Captain Watanabe accompanied Detective Rangel and a number of cops while they attempted to serve a warrant on one of the gangster Tombstone's hideouts. Spider-Man also showed up to lend a hand, and privately offered to team up with the Warith, but Watanabe insisted on doing things by the book, looking to put her Wraith persona behind her. Unfortunately, Tombstone's men got spooked and opened fire; Spider-Man apprehended Tombstone, but Rangel was shot, later falling into a coma. A week later, the warrant was thrown out by Judge Howell, as Rangel's source wasn't identified, and Tombstone was freed. Yarborough, Watanabe's new bureau chief, blamed her, and demanded a full accounting. Upset, Watanabe visited the comatose Rangel in the hospital; she ran into Peter Parker there, and they talked about the case. He advised her to stay the course, but as they talked, Teddy flatlined and died. Later, at his funeral, she wandered away from the crowd and encountered Mister Negative, who had been Rangel's source. He gave her pictures of Judge Howell buying illegal drugs from Tombstone's men; although she realized Negative was trying to play her, she didn't care. She presented them to Yarborough, and demanded that Howell be arrested immediately; Yarborough rejected them, saying they were inconclusive. That night, Watanabe donned her Wraith gear and set out for Tombstone's hideout. Spider-Man joined her, trying to prevent her from doing anything rash. After taking out Tombstone's henchmen, she did exactly that when she used a fallen goon's missile launcher to blast open a safe, knocking out Tombstone, who was hiding inside. Inside, she also found a ledger detailing Tombstone's drug deals - including those with Howell. When Spider-Man suggested that her actions were unbecoming of a cop, she told him that "Watanabe is the cop. I'm the Wraith", and left. (Amazing Spider-Man III#17.1 (fb) ) - Watanabe had the crime lab authenticate the photos of Howell, then presented the ledger to the district attorney, who gave her authority to arrest Howell. (Amazing Spider-Man III#17.1) - Yarborough chewed out Watanabe for violating protocol in Howell's arrest, then told her that he had asked to see her. On her way to Ryker's Island, Spider-Man stopped her car and informed her of a meeting between Hammerhead and the Goblin King to decide who would claim Tombstone's now-vacant territory. He also insisted that she not make this case personal, but she tossed the pictures of Howell at him and drove off. At Ryker's she met with Howell, who told her that the drugs were for his pain-stricken wife, and that he'd never done favors for Tombstone. He begged her to drop the collusion charges, as Tombstone was now considering having him killed, but she coldly walked away. Mister Negative was waiting for her in the parking lot, and told her that the Goblin King and Hammerhead were meeting that night at the old Empire Royale Theater. As the Wraith, she and Spider-Man crashed the meeting, and she told the crimelords that Tombstone's territory was now hers. Spider-Man congratulated her on the bluff, but it was no bluff. While Spider-Man took on Hammerhead, the Goblin King got away; afterwards, Spider-Man confronted her with the knowledge that another criminal was using her to take out his rivals, but she wasn't concerned. (Amazing Spider-Man III#19.1) - The Wraith explained that the Crime-Master had shot Tombstone; while he believed her, the guards didn't. She blasted them with fear gas, then ran out and snagged a passing helicopter to escape. She tracked down Mister Negative at his hideout, where he revealed that he knew her secret identity, and further goaded her by suggesting that corruption ran in her family. She had to be restrained by his Inner Demons while he tipped her off to an upcoming heist at the New York Tech Fair at the Empire State Center - and told her that he'd assign one of his Inner Demons, Donald, to watch over her. The next day, Chief Yarborough informed her that Howell had died, and blamed her - Watanabe would keep her job, but her career was finished. She went up to the police station roof to talk with Spider-Man, and told him that she could live with the results of her decisions. The next night, she and Spider-Man went to the convention center, where they found the Circus of Crime robbing the exposition. The Wraith tangled with Teena the Fat Lady, ensnaring her with her tendrils and pulling her off a ledge to crush the Clown below. She spotted Donald on the show floor, stealing the true target of the burglary - a ten-million-dollar watch. She chased him down and snapped his neck, killing him, then set off to find Mister Negative. (Amazing Spider-Man III#20.1) - As the 3rd precinct erupted in a super villain gang war, the Wraith showed up at Mister Negative's lair. She told the crimelord that she'd killed Donald, and that she'd come to kill him, as well. As she battled his Inner Demons, Negative escaped. Soon, Spider-Man arrived, and tried to convince her to leave the dark path she was walking. Unmasking, she told him that the Yuri Watanabe he'd known was never real, and that finally her true self was free. She knocked him aside and chased after Negative. Negative turned his corrupting touch on dozens of innocent civilians, who overwhelmed her until Spider-Man pulled her to safety. 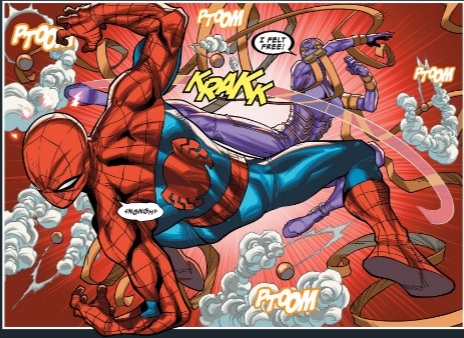 They fought, and Spider-Man swiftly landed the knockout blow. He webbed her up while he went to deal with Negative, but she slipped out of her costume, taking only her mask with her, and escaped. Comments: Created by Dan Slott, John Romita Jr., and Klaus Janson. Wraith created by Dan Slott, Giuseppe Camuncoli, and Klaus Janson. One of my favorite characters from Dan Slott's run on Spider-Man. His long run allowed him to play the long game with her character, building her up over long periods of time. I hope she turns up again. 2014 update: I hope she stops turning up so I don't have to keep editing this profile! 2016 update: You're killing me here. The armored nature of her costume is never mentioned outright, but we do see some goons shooting right at her, and she doesn't seem terribly bothered. Thanks to Chris McCarver and Mike Fichera for IDing Yuri's military uniform. (Amazing Spider-Man III#19.1 (fb) ) - NYPD Sergeant Kenneth Watanabe was awarded the NYPD Medal of Honor for an act of extreme courage; the ceremony was attended by his son John and granddaughter Yuri. (Amazing Spider-Man III#19.1 (fb) ) - Kenneth died at some point before his son's convinction on bribery charges. (Amazing Spider-Man III#19.1 (fb) ) - NYPD officer John Watanabe and his daughter Yuri attended a ceremony honoring his father. (Amazing Spider-Man III#19.1 (fb) ) - John was convicted of taking bribes. (Amazing Spider-Man II#663/1 (fb) ) - A hardened criminal and lieutenant of Mr. Negative, at various points in his life Ronnie Chin burned down a house, threw a man off a train, and buried a woman alive. (Amazing Spider-Man II#664/1) - The Wraith attacked Rothner in his store, terrifying him with knowledge of his past crimes; although fearful of Negative's retribution, he relented when she revealed her "true face" and told her about Negative's plan to smuggle heroin-filled statues into the Metropolitan Museum of Art. (Amazing Spider-Man II#664/1 (fb) ) - Robert Ross was a notorious human smuggler; numerous people died, packed into his shipping crates, and those who survived were sold into slavery. Eventually, he changed his name to Ben Rothner, established Rothner Antiques, and began smuggling art instead - often with drugs inside, destined for Chinatown crimelord Mr. Negative. (Amazing Spider-Man II#663/1) - The Wraith cornered Chin on the East River docks. As she displayed uncanny knowledge of his criminal past, he demanded to know who she was, prompting her to unmask herself, revealing her to be Jean DeWolff! 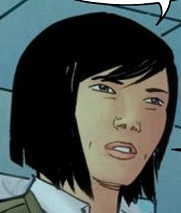 The next morning, Chin confessed his crimes to NYPD captain Yuri Watanabe (unaware that she was actually the Wraith), terrified that the Wraith might return for him.